We again have purchased three large 40-foot containers with wire wheels and accessories at really good conditions. More than 300 different Dunlop MWS spoke wheels, beautifully finished and perfectly balanced wheels at sensational prices! These price are valid while stock lasts and end finally february 28th 2018. Find all our spoke wire wheels here. 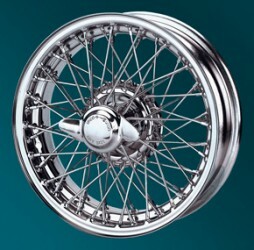 Chrome-plated spoke wire wheel with 72 spokes and 42mm mount. Rim inset: 13.00 mm, max. load 450 kg. For use with MG MGA, MGC, Austin Healey BN1, BN2, BN4, BN6, BN7, BT7, BJ7 and BJ8, Triumph TR4, TR4A, TR5/250 and TR6. Chrome-plated spoke wheel with 60 spokes and 42mm central lock holder. Rim inset 14mm, max. load 450 kg. For use with MGB and MGB V8. 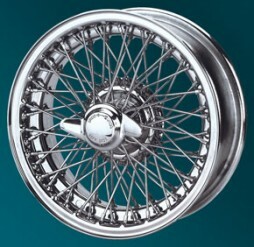 Chrome-plated wire wheel, size: 5.0J x 15" with 52mm mount. 72 spokes, rim inset 20.60 mm, load capacity: 560 kg, Curly hub rim, tubeless. 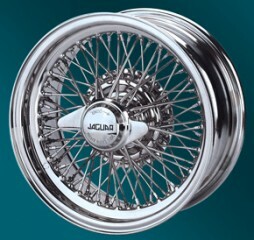 For Jaguar E-Type 3.8 and 4.2 Series 1, Mark I+II, S-Type 3.4 and 3.8, 420 and Daimler 250 V8 Sedan. Also for Alvis: 21TD, 21TE, 21TF and Jensen: 541 and C-V8. Curly Hub tubeless rim with 52mm mount. 72 spokes and 2mm offset. Load capacity 560 kg. For use e. g. on Jaguar E-Type Series 1 and 2. Chrome-plated spoke wire wheel, tubeless with 42mm mount. 60 spokes, load capacity 310kg per wheel. For use on: Austin Healey BN1 and BN2, MG MGA, MG-TD and MG-TF, Triumph TR2, TR3, TR3A, TR4 and TR4A, TR5 and TR250. Black Series Wire wheel 5,0x15"
Find all our black wire wheels here. Balancing spoke wheels exactly requires experience, know-how and a specially equipped workshop. To ensure you the safety of professional work, we also offer each wheel as a complete wheelm package. The wheel/tire combination is electronically balanced and naturally filled with the correct air pressure. We only supply original Dunlop MWS spoke wheels, the original equipment manufacturer of many classic vehicles of the 50s and 60s.